The caption on the above Tudor Collins photo, ex Auckland Museum (via Lew Redwood fb) states that the photo is dated 1936 & possibly / probably Mansion House Bay, Kawau Island. Interested in ID’ing the closest launch to the shore. At first glance I thought Tasman, then Rehia but the shape & number of portholes is all wrong – what say the Woodys? The dark hulled vessel behind, could be one of the early pilot boats – Ferro? And any clever yachties able to ID the small yachts – mullet boats? From what I can make of the name on her transom, the light coloured hull looks to be Vaalele, V-78, built by Charlie Hardman to a Ralph Goodwin design in 1936.She was one of the four Auckland 18-footers that travelled to Sydney for the first World’s 18-footer championship in 1938. Charlie Hardman kept Vaalele until 1939 when he sold her to S.H. Bailey. The darker boat is a bit later and looks to be quite new. She’s marconi rigged and could possibly be another Charlie Hardman / Ralph Goodwin boat, Vindex, V-35 built in 1939. Marconi rigs were not common in the V-class but by 1939 the more competitive yachtsmen were moving away from gaff. From other photos I have seen, she was painted a dark colour, either black or royal blue and was marconi rigged. Vindex was laid up in 1940 and In 1944 he sold Vindex to Keith Atkinson who was working at Lidgards with Hardman. Steve sent me the 2 b/w photos below (ex NZ Herald) of RF as launched – what a stunner, just about perfect from any angle. Steve confirmed Ken Rickets comments re being lengthened (by 6′). RF is currently in the very capable hands of Dave Patterson of Leader Boats in Pakuranga undergoing a total refit. I will updated the restoration story with new photos. 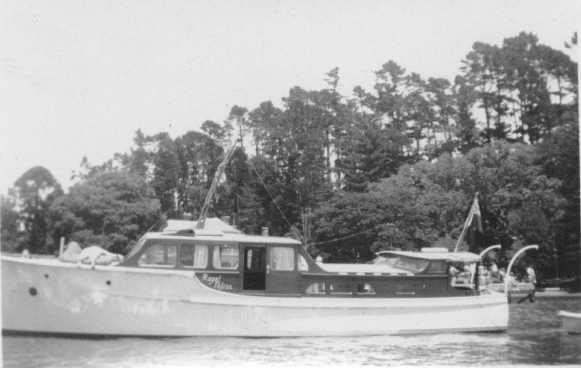 This entry was posted in 1930's, CYA Boat, Launches, Mystery Boat, Non Waitemata, Sub 28', Working Boats, Yachts and tagged Ferro, Kawau Island, Mansion House Bay, Royal Falcon, V-78, Vaalele by Alan Houghton - waitematawoodys.com founder. Bookmark the permalink.